Suite #2 from "Daphnis et Chloé"
The world of classical music has not had an especially good week as of this writing. Bankruptcy, resignations, and insensitive commentary has colored the industry less than a full week into the month. And yet, Detroit – no stranger to any of the above mentioned problems – has had a fine few weekends, starting with a one-night concert from Chinese pianist Lang Lang. Now in the official opening weekend, the Detroit Symphony daringly presented a new violin concerto from Chinese-American composer Bright Sheng. A somewhat small but entirely appreciative crowd gathered to hear what their orchestra sounded like to start the 2013-2014 season. So far, the returns are almost entirely positive. Anyone who has read my previous work knows the hallmarks of this orchestra; extremely fine winds and strings, allied to questionable brass and a strong podium presence in Leonard Slatkin. Or I should say these were the hallmarks, because the brass playing has taken on a winning warmth and fullness of tone. Meanwhile, the strings have retained their sheen and sound better than ever thanks to new players. And of course, the winds are as virtuosic and lovely, a strength of the orchestra since the days of Paul Paray. Slatkin seems happy and excited to be back, and a season that carries these qualities all year will be very special indeed. On either side of the concerto by Bright Sheng were a quartet of favorites. The Rimsky-Korsakov piece needs the daylights played out of it to work, and Slatkin and his orchestra delivered. Credit Yoonshin Song – who had quite a bit to do on this occasion – for keeping the strings so together and razor sharp. Impressive too were her various solos throughout the evening. As a whole, the orchestra showed immediately their distinct improvements in the brass section, as well as a total commitment to the music that hopefully will become the norm. As for the Ravel, Slatkin just recorded a fine disc of the composers' music for Naxos in Lyon, and for my money these performances were better. To my ears, the Detroit musicians simply outplayed their French colleagues. But this is not a CD review, so I will simply say that his is some of the most beautiful playing I have heard at Orchestra Hall for some time. That brings us to Bright Sheng's Let Fly. Slatkin's witty and informative pre-concerto introduction was most welcome, and he compared the piece to the great Romantic period concertos, especially Brahms. The comparison was mostly apt; it's a wonderfully crafted, entirely personal compositional statement that draws on folk tunes and a lyrical use of the violin. That's where the similarities ended. It's really a very interesting piece; if Brahms had met with the composers of The Butterfly Lovers concerto, this may have been the result. This is no disrespect to Sheng – a fine composer on the faculty at the University of Michigan – for both aforementioned pieces are excellent in their own way. 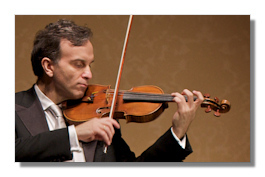 In fact, Gil Shaham has recorded both works to universal acclaim, though none will doubt the Brahms as the superior creation. Editorial comparisons aside, the work was magnificently rendered by Shaham, and Slatkin also believes strongly in the work. If there are any flaws, they are minor. For one, the work lacks the "tunes" of the great concertos, and none of the melodies linger in the mind. Secondly, I found some of the orchestral writing unattractive, and transitions in the work were not always the most natural. Still, you could say the former about say, Schoenberg's concerto, and the latter even of Tchaikovsky's. When all is said and done, I suspect that Sheng's daring, virtuoso creation will see many more performances. Perhaps the idea of a world-premiere on opening weekend scared some patrons off. Certainly, Shaham can play any of the great concertos magnificently, and his recordings have a hallowed place on my shelf. Still, the Detroit Symphony continues to maintain an admirable commitment to new music, and the bonus of engaging a local composer is a further credit to those at the helm. As a Detroit-area native, it's nothing short of a thrill to have so many reasons to be proud of my local orchestra. I look forward to a spectacular 2013-2014 season!